Lock in a great price for Hampton Court Motor Cruiser – rated 9.3 by recent guests! Location and expierience! How cool to sleep on the river!?!?! Amazing! Nice tranquil marina beautiful location a very pleasant short break .Will return. Bed very comfy. Location amazing.. peacefull and soo relaxing. The Cruiser itself was luxurious and very well maintained. The owners has done extra touches you would expect in a hotel like chocolates on the pilow and on request had added birthday decorations and bubbly! For an overnight stay was a little different yet nice to feel the room rock from side to side slightly as we moved around or in response to a swell on the river. An amazing quirky place to stay, both my partner and I enjoyed it so much. A very unique experience, great value for money. We would like to return in the summer. Just something completely different where you could relax and get away! Hampton Court Motor Cruiser is a heated 4-berth boat moored in Hampton Court, located near Hampton Court Palace. The boat is moored 0.5 miles from Hampton Court Train Station, offering links into London Waterloo Station as well as a choice of restaurants and pubs. Facilities in this self-catering accommodations include heating throughout, fully equipped kitchenette, wet-room, Smart TV, WiFi, HiFi, Netflix, Alexa, towels and bed linen. Although the living area is open-plan, the cabins can be sectioned off for visual privacy. The price per stay also includes the free use of barbecue facilities. There is a selection of petrol motor boats to hire and free use of pedalos and paddle boards subject to availability. The property can also quote for tailor made cruises/charters upon request. Hampton Pool is a 20-minute walk away offering a heated open-air lido open 365 days per year. Hampton Court Motor Cruiser is 8 miles from Heathrow. This property also has one of the top-rated locations in East Molesey! Guests are happier about it compared to other properties in the area. This property is also rated for the best value in East Molesey! Guests are getting more for their money when compared to other properties in this city. When would you like to stay at Hampton Court Motor Cruiser? This exclusive use self-catering cruiser features heating throughout, WiFi and most modern conveniences. Private parking is available at a location nearby (reservation is needed) and costs GBP 5 per day. 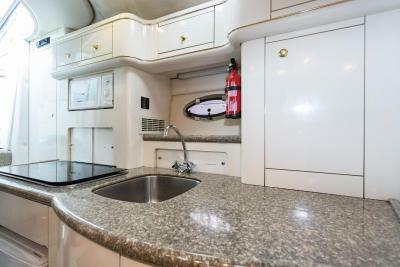 House Rules Hampton Court Motor Cruiser takes special requests – add in the next step! A GBP200 damage deposit is required 0 days before arrival (about USD258.14). This deposit will be fully refunded 7 days after check-out, as long as there isn't any damage to the property. A GBP 200 security deposit is required via PayPal or bank transfer prior to arrival for guests to receive full access details. This deposit will then be refunded within 7 days from checkout subject to a damage inspection. Subject to availability, early and late check-in/out can be arranged in advance and are charged at GBR10/hour to be paid directly on arrival. Guests are also required to send the property a copy of their photo identification prior to arrival. Please note there are no staff on this cruiser. There are a selection of petrol motor boats to hire from GBP 35 to GBP 75 per half day (March to November only), plus free use of pedalos and paddle boards (subject to availability). Off-road parking can be arranged in advance at a local Hotel 1,150 feet away for GBP 5 per night or there is a metered parking facility available nearby. A damage deposit of GBP 200 is required when you book. That's about 258.14USD. This will be collected by bank transfer. You should be reimbursed within 7 days of check-out. Your deposit will be refunded in full by bank transfer, subject to an inspection of the property. The bathroom facilities, though very clean and well presented, were normal typical small yacht style. They had an integrated shower but were very close quarters and possibly not to everyone's liking. Self contained, quirky, everything you needed was there. Excellent accommodation aboard a well maintained and equipped cruiser. Owners even put out balloons and banners for my wife's birthday. Clean & comfortable, excellent location and short walk to Hampton Court Palace (Xmas ice skating). 😁 Local garage near by for essential extras but all that was needed was proved. Fantastic will definitely be staying again. Great stay. Great location. Well equipped, warm place to stay. Loved everything about it. There were so many hidden touches on Baboo - just little things we discovered which turned an average stay into a great stay. Natasha had left out a fabulous welcome for us which we loved. The boat was so clean and we had an amazing sleep, rocked to sleep. We will be back.